Talking Trash, in the Oceans That Is! “The Great Pacific Ocean Garbage Patch“ sounds like a Charles Schultz story that would’ve featured Linus, Snoopy and the gang. The reality, however, is a sad but true story about the ever-expanding floating islands of garbage in our oceans. After watching news coverage like BBC’s recent article “Sea of Plastic”, we can better visualize the problem, and see that it is indeed real. Scientists and officials debate about the location, depth, breadth, and even the appropriateness of the name for these floating trash islands. But, the debate seems scholarly and the problem so very distant from our day-to-day lives. One can’t help but wonder if it all really matters. Even if it does, can we do anything that will have a real impact? In reality, the problem of trash islands in the oceans is growing at a significant rate. These “garbage patches” have accumulated in mass in certain areas of the Atlantic, Pacific and Indian Oceans. Not only are they here to stay, these islands of floating trash are growing. The largest of these is known as “The Great Pacific Garbage Patch.” It stretches intermittently across the Pacific from California to Japan, and is estimated to contain somewhere between 200,000 and 500,000 tons of garbage. About half of the trash is reported to be plastic bottles. The rest consists mostly of packaging. The impact is more than to just sea turtles who mistake the floating grocery bags for jellyfish. 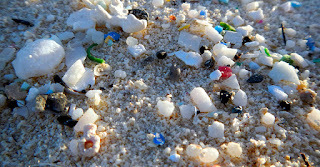 The floating plastics eventually break down into tiny particles called microplastics that are ingested by aquatic life. Think about that tuna sandwich you had for lunch. The tuna may have eaten the equivalent of a plastic bottle or two. Then you ate the tuna. 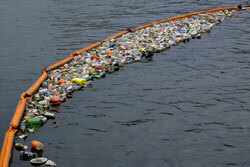 The chemicals from the plastics also leach into the water and infuse broad ecosystems with toxins. Completing the cycle, the water from the ocean supplies moisture to the air we breathe and to the sky for rain. 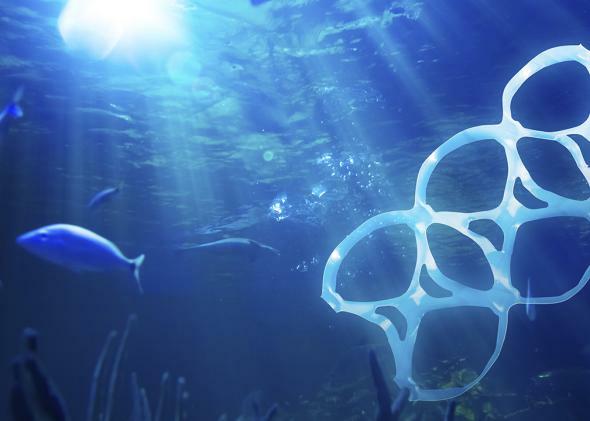 The EPA estimates that 80% of marine debris originates as land-based trash. Every stream, river and lake eventually empties into the ocean. That means that the candy wrapper flitting around the parking lot is likely going to end up in the stormwater system. The same for the overflowing trash bins we see every day in public outdoor places. What can you do? Pick up your loose trash and make sure it’s contained appropriately. 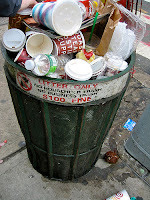 If you see overflowing trash bins, notify the responsible parties. By letting them know that you care, you’re helping them make it a priority. 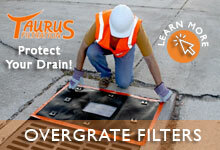 Keep an eye out for unguarded storm drains in your cities and neighborhoods. 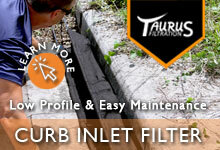 Storm drains typically empty directly into the waterways (streams, rivers, etc.) without any filter in place. 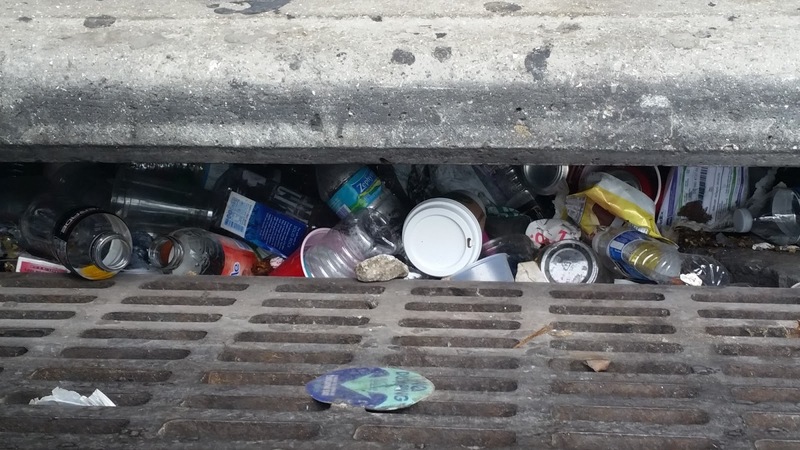 Storm drains can be equipped with inexpensive guards or filters (such as GEI Works’ Curb Inlet Guard) to capture free floating trash and prevent it from entering the water systems. Note: Curb guards need to be periodically emptied. If you see a curb guard that is full, please help by alerting your local stormwater authority. If you live near a body of water that is prone to accumulate trash, encourage your local stormwater management authorities to implement a debris management system. GEI Works manufactures custom solutions such as trash boom for these types of projects. With your help as good stewards of the world’s most precious resource (water), we can all look forward to a brighter and healthier tomorrow! Sebastian, FL: With Hurricane Irma tracking towards Florida, GEI Works is looking for ways to help its employees and members of the community be better prepared. As a local manufacturer, GEI Works carries emergency supplies, spill containment and compliance products for facilities and construction sites. We have witnessed the devastation that Hurricanes cause in Florida, and with heavy rainfall and high winds the least of the damages that can occur, we know to plan and prepare early for all eventualities. Check out our Emergency Supplies Page Here or call us at 772-646-0597 for in-stock items you need, or quick turn-arounds on products we manufacture. Knowing your risk, getting prepared, and staying informed are just a few steps you can take to get ready for Hurricane Irma. To search for general information about risks in this area, visit https://www.ready.gov/florida. Check out NOAA’s historical hurricane tracks tool at https://coast.noaa.gov/hurricanes/ to check the severity and frequency of past hurricanes in here in the Central Florida area. Take action now to be prepared for hurricane Irma! As the storm approaches, it is often too late to get ready. 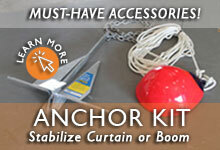 Make sure you have family evacuation and communications plans, and update your emergency supply kit. 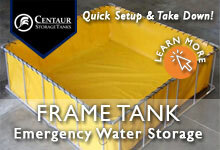 GEI Works is on hand with pre and post-storm products such as sand bags, drinking water storage tanks, and spill absorbents. The FEMA App located here, includes disaster resources, weather alerts, safety tips, and a new feature that will enable users to receive push notifications to their devices to prepare their homes and families for disasters. The app also provides a customizable checklist of emergency supplies, maps of open shelters and recovery centers, tips on how to survive disasters, and weather alerts from the National Weather Service. Know where to go for trusted sources of information during a hurricane event. Sign up for alerts from your local emergency management office so notifications, including evacuation orders, go directly to your phone and email. Monitor local news for hurricane watches and warnings in your area and follow directions of local officials. Make sure you have a battery -operated or hand-crank radio available should the power go out. Evacuations are more common than people realize. Make yourself familiar with your community’s evacuation zones, so you’ll know exactly where to go. It Came From Sargasso: Keeping Beaches Clean From Sargassum Seaweed! Welcome back to our Aquatic Plant Control Blog Series. Over the past few weeks, we have explored blue-green algae, water hyacinth, and duckweed control. Today we close out the series with a discussion on sargassum seaweed. Sargassum originated in the Sargasso Sea (which is named after the sargassum seaweed that creates its unique ecosystem). The Sargasso Sea is in the Atlantic Ocean near Bermuda. Christopher Columbus first documented encounters with Sargassum in his expedition diaries in 1492. So why talk about sargassum today? Sargassum floats in large mats on the ocean’s surface and has been washing up onto beaches in greater quantities since 2011, flourishing as water temperatures continue to rise and Gulf Stream currents change, especially in the Caribbean and the Gulf of Mexico. Nutrient loading from inland water sources traveling to the ocean nourish the Sargassum fields, making this an ever-growing concern. Why is Sargassum a Problem? The tourism industry dreads sargassum seaweed and goes to great lengths to keep beaches clean. While sargassum does not harm people, it diminishes their vacation experience primarily due to the off-gassing of decomposing sargassum. Off-gassing creates a pungent odor and can sometimes cause headaches and affect breathing. It may also corrode electronics and appliances. For coastal resorts that rely on providing their valued guests a restful and exotic getaway, the impact and cost to maintain their beaches is significant. Are There Benefits to Sargassum? When sargassum is not washed up on beaches it is a floating habitat for a variety of sea life. Sea turtle hatchlings use sargassum as food and shelter. 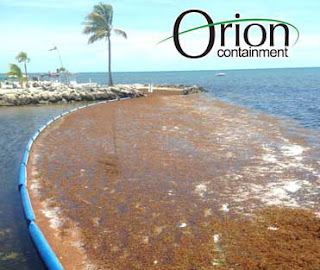 Sargassum removal is not just to improve the view off your balcony. While beachfront property owners, resort managers, and hoteliers see and smell the negative impact of sargassum, it is common in the Caribbean to harvest sargassum to be used as fertilizer. Because sargassum is carbon and nutrient rich, farmers in Antigua, Barbados, and Tobago use sargassum as an organic fertilizer and soil conditioner. However, the last few years have proven to be a challenge to keep up to the enormous quantities that wash ashore daily. Is There a Barrier for Sargassum Control? Whether you plan to harvest sargassum or divert beach seaweed away from the shore, Aquatic Plant and Debris Boom can be used to contain, deflect or exclude sargassum to help keep beaches clean. Let GEI Works help implement a sargassum control strategy for your waterfront property. 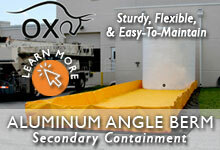 Contact a product specialist today at +1-772-646-0597. Welcome to Part Four of our Aquatic Plant Control blog series! The topic floating in this week is duckweed. 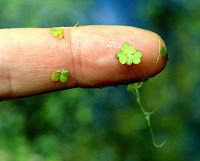 Duckweed is a species of floating aquatic plant and is extremely small, some species averaging less than 2 mm in length. While small in size, duckweed packs a big punch. Duckweed is often denoted by its rapid growth and reproduction which is achieved through asexual budding. In the right conditions colonies of duckweed double in surface area coverage in just 48 hours! As a result, duckweed can quickly cover slow moving water bodies in shorter spans of time than most other species of invasive aquatic plants. Duckweed is easily transplanted from one water body to another either through the natural flow of water or borne aloft on the bodies waterfowl. When birds land in a new lake, pond, or stream, they carry duckweed with them into a new environment and where it begins to propagate if conditions allow. What are the benefits of duckweed? Across the world, duckweed is largely a beneficial species of aquatic plant. In Asia, duckweed is used as a food source due to its high-protein value and even contains more protein than soybeans! When cultivated, duckweed is a plentiful food source for humans and waterfowl (hence the name “duck” weed) and offers habitats for various other types of aquatic life. Additionally, duckweed can be used to absorb nitrates and phosphates, and the plant also decreases the evaporation speed of water in drought-prone regions. What are the problems with duckweed? Despite the benefits of duckweed, it is an invasive aquatic weed. Duckweed plants aggressively invade water bodies, and if uncontrolled, they quickly become a problem as the duckweed covers the entire surface area of a water body. As the duckweed blocks sunlight from reaching the floor of the water bodies, native species of aquatic plants die off, reducing the oxygen dissolved in the water. Fish and wildlife are harmed or displaced. Duckweed problems are not only a common backyard pond concern. Many parts of the world struggle with duckweed control, including Asia, South Africa and parts of the U.S. including Florida Everglades, parts of Oregon, and many more regions. Is there a duckweed barrier I can use for duckweed control? Duckweed control, whether to harvest as a food source or to help contain it to a designated area, can be achieved through the use of an aquatic plant control boom (also referred to as a duckweed barrier). Aquatic plant boom serves as an excellent means of controlling duckweed as it can coral floating plants into an ideal location for harvesting, removal, or containment. 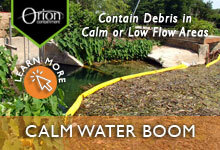 Learn more about aquatic plant control boom at GEIWorks.com or contact our team of specialists at 772-646-0597! 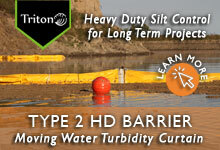 Did you miss our last posts in our Aquatic Plant Control series? Feel free to visit our entries on Blue-Green Algae and Water Hyacinth! Moreover, be sure to come back next time for our final post in our aquatic plant control series on Sargassum! Water Hyacinth, the Amazonian Invader! Welcome back for Part Three of our Aquatic Plant Control blog series! This week our topic is water hyacinth. Water hyacinth is an aquatic plant which originates from the Amazon basin in South America. This plant is a type of free-floating perennial aquatic plant native to the sub-tropical and tropical regions of the Amazon basin and is also an invasive species in areas throughout the world. Water hyacinth is denoted by its’ thick, broad, glossy leaves and its floating characteristics. These aquatic plants can grow almost four feet off the water’s surface, and extend below the surface with purple feather-like roots. This invasive species reproduces quickly and, when it isn’t managed, the plant can rapidly cover the surface of a water body. 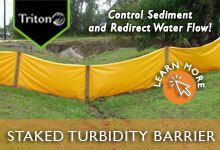 This blocks sunlight from penetrating through the water column and leads to the die-off of native aquatic plants. The death of these native plants leads to an influx of bacteria that consume the decaying plant matter. These bacteria deplete the dissolved oxygen and available resources leading to the death of insects, fish, and other types of aquatic life. Furthermore, colonies of water hyacinth serve as habitats for mosquitos and snails carrying parasitic flatworms that can cause snail fever in humans. In addition to being a health risk, this invasive plant also interferes with boating, fishing, swimming, and shipping. 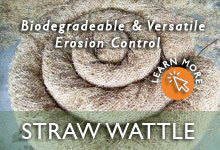 Water hyacinth has found its way into many countries around the world, including the United States. It was first brought to Louisiana at the World’s Fair in New Orleans back in 1884. The plant quickly spread across the waterways of Louisiana and is also found in Florida. The prevalence of water hyacinth in these waterways halted their use and became an economic concern as fish began to die off, and the gears of the shipping industry ground to a halt in these areas. While chemical and biological methods have seen use throughout the years, one of the most common ways to mitigate the prevalence of water hyacinth on water bodies is through mechanical removal. The utilization of aquatic plant boom is one method used to contain, gather and remove these invasive aquatic plants from the water’s surface. 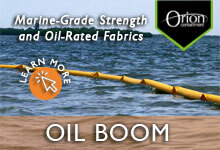 The boom’s rugged design can withstand extended use in many water environments and can contain algae, duckweed, seaweed, trash or timber, in addition to water hyacinth. 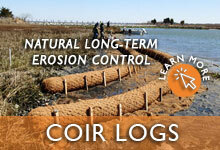 Learn more about aquatic weed control and containment on our Aquatic Plant Boom page at GEIWorks.com! Stay tuned as we continue our Aquatic Plant Control blog series! Holy Guacamole! What is Blue-Green Algae? Sometimes referred to as “guacamole” algae, blue-green algae is composed of Cyanobacteria. These organisms feed on the nitrates and phosphates from fertilizers used on farms and in urban environments, and as the excess nutrients build up in waterways from faulty dikes or stormwater runoff, algae populations thrive, and their population increases dramatically. The growth and spread of algae will often block sunlight from the floor of a water body, causing aquatic plants to die off. The resulting dead organic matter becomes food for other bacteria that decompose the decaying plant life, and with a much larger food source, these bacteria begin to use up the dissolved oxygen in the water. Fish and aquatic insects are the first to die off when the dissolved oxygen is used up, then, manatees, dolphins, and larger marine life begin to lose their food source from habitat destruction. Furthermore, blue-green algae produce a neurotoxin called “microcystin” which is harmful to humans, animals, and aquatic life. While this toxin primarily targets the liver, it is also a skin, eye, and throat irritant. For this reason, communities issue public health advisories during blue-green algae or cyanobacteria blooms to protect people and their pets. GEI Works manufacturers floating containment boom that can effectively manage and section off large algae blooms, however, for projects like the Okeechobee Lake Reservoir Plan, it is necessary to include long-term management and mitigation of nutrient and stormwater runoff. Water quality impacts us all. Blue-green algae and cyanobacteria not only occur in Florida but throughout the US and around the world. 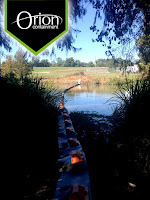 GEI Works provides global water pollution prevention and containment solutions such as turbidity curtain, aquatic plant boom, erosion control products, stormwater BMPs, flocculants, water trailers, secondary containment, and more. 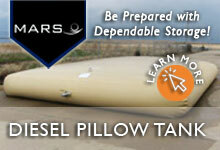 For more information contact us at 772-646-0597 or visit GEIWorks.com. Stay tuned next week as we continue our aquatic plant control blog series! Float into our blog series on Algae and Aquatic Plant Control! We’re excited to announce our new blog series on aquatic plant control! Aquatic plants are an important part of the ecosystem, however invasive and non-native plants can impair water systems and impact fish and wildlife habitats, conservation efforts, marine navigation, recreation, tourism, irrigation, energy, and drinking water. How do you control these inconvenient organisms? Blue-green algae, sargassum, water hyacinth, and duckweed are all types plants/algae which typically float on, or near, the surface of a water body. GEI Works manufacturers the Orion Aquatic Weed Control Boom to contain, deflect, or exclude aquatic plants in a variety of water bodies and conditions. Our Orion Aquatic Plant Control Boom is treated with algaecide and can be customized for temporary, long term, or permanent applications for seasonal algae blooms or long term aquatic plant control. 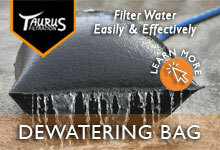 Need a solution for your floating plants or algae? 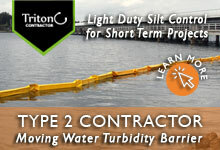 Contact a floating barrier specialist at GEI Works at 772-646-0597 or visit our website. Let’s get social! Stay connected with us on social media. Follow GEI Works on Facebook, Twitter, LinkedIn, and YouTube with the links in the right-hand sidebar, and be sure to check in next week for the first installment of our Aquatic Plant Blog Series on blue-green algae! Agricultural Water Trailers: "Water you waiting for?" 1. 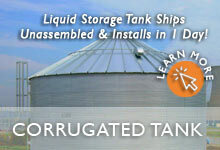 Mash spreading – Corn mash can be loaded into our water trailers with the addition of a few modifications to the pumping system of the water trailer. This mash can then be delivered to various locations and used as livestock feed. Often, this makes use of a common byproduct of distilleries. 2. Pesticide application – Pesticides can be mixed into the water supply in the tank then sprayed onto the applicable crops. While there are often larger scale methods of accomplishing this, using a water trailer offers a more flexible method of application, along with the mobility of water transport. 3. Odor suppression – With the use of certain organic cleaners, Argo Water Trailers can be optimized to eliminate odors on livestock and agricultural farms. It can be as simple as including a concentrated organic cleaner in the water reservoir of the trailer and applying it to a designated area. 5. Hydroseeding – Hydroseeding decreases erosion and enriches the soil by distributing a mixture of seed, fertilizer, and mulch. Often used to prevent soil erosion, hydroseeding mixtures can be applied to fields and hillsides to prevent the erosion of cropland from water and wind. 6. 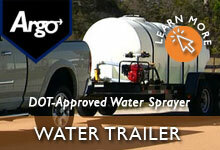 Livestock watering – Livestock watering is one of the simplest, but most important application for Argo trailers in the agricultural industry. Each water trailer comes standard with the capability of containing potable drinking water and, because of its mobility, can deliver this water to a location on-demand. 7. 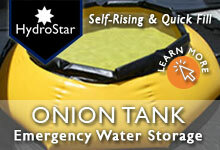 Crop protection –Water trailers can be used for crop protection in the winter. In Florida, for example, farmers will spray down orange trees if the temperature will reach freezing that night. Crop icing isn’t limited to just oranges, however, as mangoes, avocados, strawberries, limes, and even corn can survive frost and freezing temperatures through the icing process. Read more here. The agricultural industry is as vast as it is varied, and GEI Works strives to meet or exceed the needs of farmers and livestock owners. 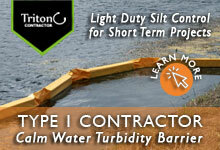 To learn more about product solutions by GEI Works, check out our Water Trailers, Livestock Troughs, or CitrusTubs.